During my childhood, we had many different pets. Of course the standard types were represented; there were innumerous cats and one small but very loud and lively dog. As a pre-teen, I chose a hamster as the pet I wanted to call my own, which only ensured that my mom and I would have a weekly battle regarding the cleanliness of the cage (and probably my room, too). My sister brought home a King snake that she named Elvis (har har), which my dad had to feed because of the “ick” factor of the live mouse situation. There was also a rabbit that chewed on all the bookshelves in the living room, a gigantic fish called Big Hex, a trillion guppies, and two ducks named Bonzo and Quackers. I don’t remember the circumstance of why Bonzo and Quackers came to live with us, but they roamed free in the back yard and frolicked in the kiddie pool. Our neighbor took to plucking the snails out of his yard and bringing them over for the ducks, served up on a Frisbee platter. They were living the high life, except for when my dad would steal gather up Quackers’ eggs. I don’t think she appreciated that too much. I believe the story goes that he had to nab them when she wasn’t paying attention or catch her wrath. But he loved those duck eggs and I remember being appalled by it. First, how awfully mean of him to take Quackers’ eggs. What’s wrong with having a back yard overrun by ducks? (I should mention that we did not live on a farm.) Second, duck eggs? Gross. My six-year-old brain couldn’t comprehend eating any kind of egg other than the “regular” kind. Actually, I've had a bit of a rocky relationship with eggs in general. There was a period in my partying days when it seemed like anytime I was even the slightest bit hung-over, someone in the house would make eggs. The smell of eggs has a way of making my already upset stomach even angrier. Needless to say, I didn’t eat a lot of omelets in those days. Then there’s the other slight problem: I cannot cook eggs. Scrambled, I can fake my way through…but fried or poached? Forget it. I have never been able to fry an egg without breaking the yolk or turning the entire thing to rubber. This is a well-known fact in my family, and both my dad and Andy snickered and had hilarious things to say when I informed them that I needed to come up with an egg dish for the Foodbuzz Tastemaker Program and Eggland’s Best. Normally they handle all egg-making duties, but I was determined to do this on my own. And I’m not going to lie…my scrambled eggs did look a little funny, but they tasted just fine. Combine goat cheese and minced herbs together in a small bowl. Reserve. In a large bowl, beat eggs and whisk in cream, tomato, gruyere, red pepper flakes, salt and pepper. Melt butter in a non-stick pan and pour egg mixture in. Cook eggs to desired doneness. 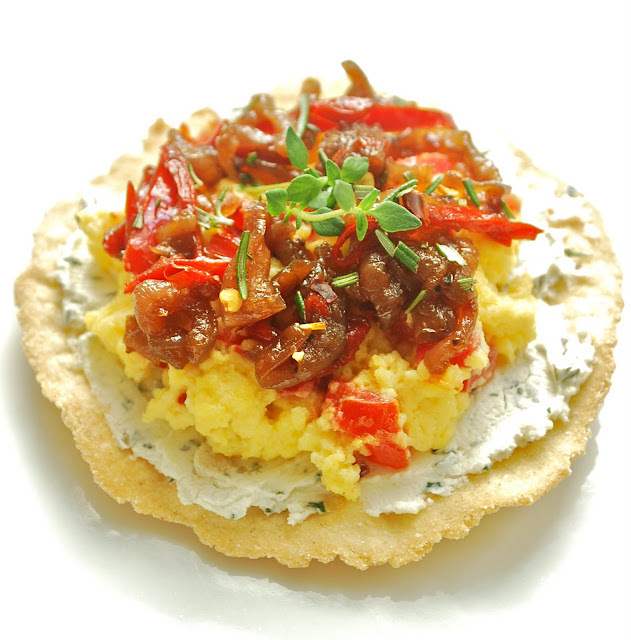 To serve, spread about 1 tablespoon herbed goat cheese onto a tortilla. 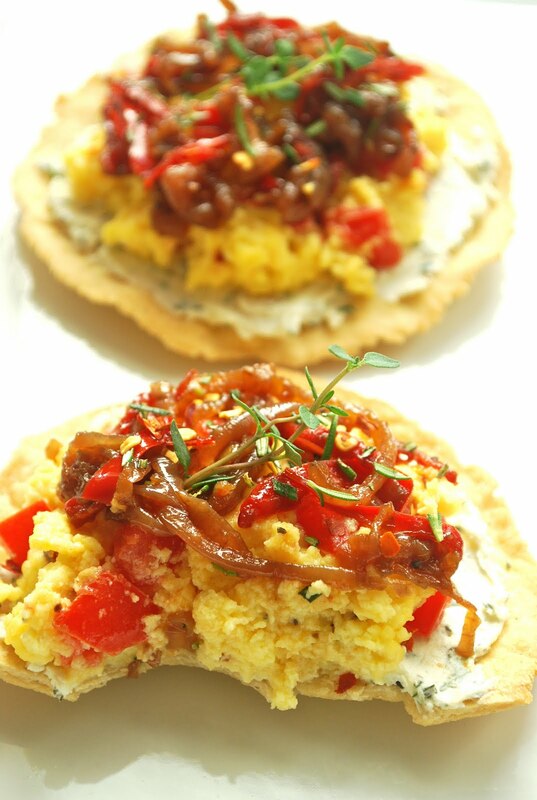 Top with scrambled eggs and caramelized onion mixture. Garnish with chopped herbs and red pepper flakes. So, even though my scrambled eggs weren’t picture perfect, the dish as a whole was. The combination of the deep, rich flavor of the caramelized onions, the freshness of the herbs and the tang of the goat cheese was just right. If every egg dish tasted like this, we could be very good friends. I think that those are the prettiest scrambled eggs ever. So don't run yourself down. You CAN cook eggs - really well. Have a great weekend! These look beautiful! 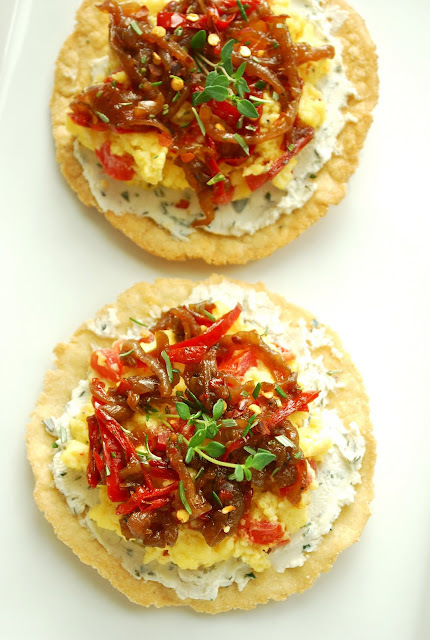 Love the goat cheese and caramelized onions. Yum! I have never been a fan of eggs either. But once you put the caramelized onions and everything else on there I might be able to eat them! I think your eggs are gorgeous. I loved the pet stories (especially Elvis the king snake). Congrats on a successful Eggland meal! yaozer. yes please. more more more. i love eggs. Nothing taste better than these onions; erfect with eggs; I have to try this for sure. This looks delicious! 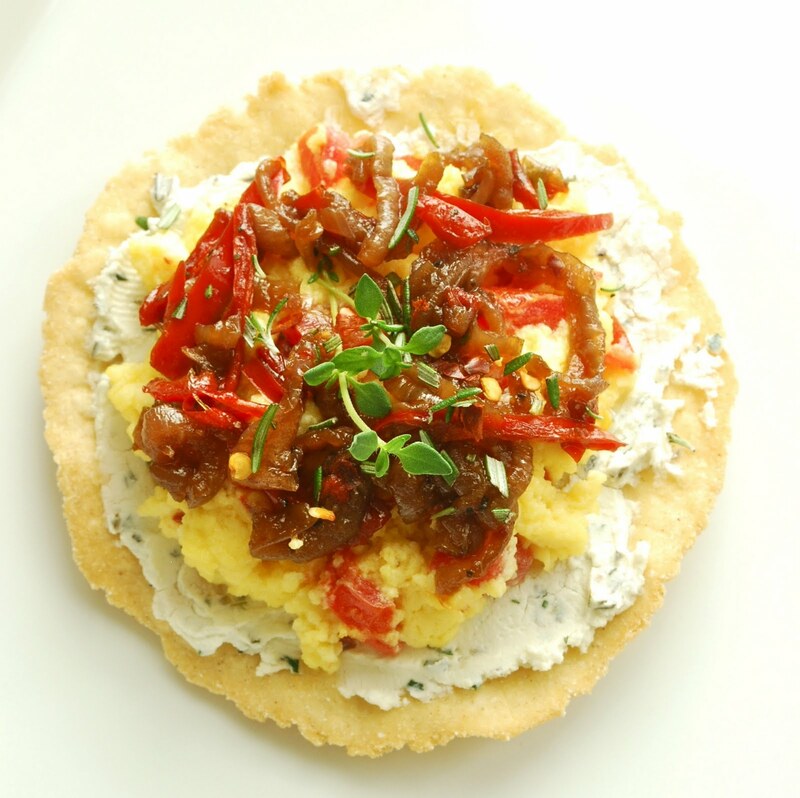 I make a mean pita-pizza with caramelized onions - you've inspired me to write a post about it! Oh how wonderful, the flavors you have combined!!! Looks super delicious, even your eggs :) I have always said, cooking eggs perfectly solely depends on the pan you use. Good quality, non-stick with lots of no-stick cooking spray! Wow, simply beautiful! We love eggs! 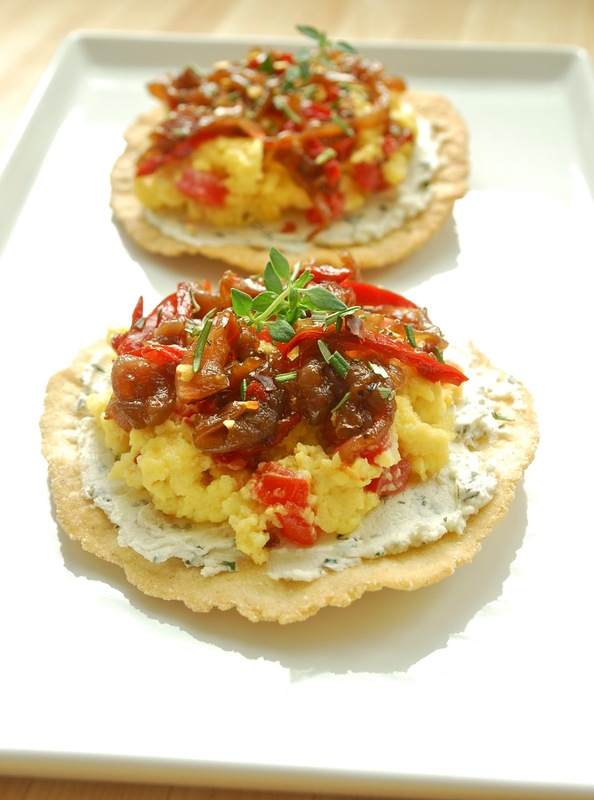 This looks perfect, not only for breakfast, but would be great for parties too! Great job, Karen! Have a lovely weekend! This looks so mouthwatering! I think I could eat this at any time! Ooooh I love your breakfast dish!! And it looks so beautiful! Great presentation! I love how you caramelized onions very well...those caramelized/sweetened onions must be a great combination with the egg and goat cheese. I have never put all these ingredients together, but it sounds very yummy. Very creative dish Karen! I refused to eat eggs for years after a seventh grade science project that went wrong. But I eventually got over it and your eggs look delicious! Great take on the challenge. This dish looks very tasty! I'm not the biggest onion fan but I reckon they taste outstanding with the goat cheese. Well done! I could eat eggs every day; these look amazing and just the thing to spice up my breakfast rotation! Scrambled eggs are my favourite way of serving up eggs too. I think because it's the easiest!! This looks just delicious! So many yummy flavours! Amazing breakfast goodie there. Looks delicious. Yuuuuum! Caramelized onions are so beautiful! I would love to have ducks in my yard! These tostadas look so delicious Karen. I'm not much of an egg fan either--I have to be in a certain mood. Your mixture of carmalized onions, peppers and goat cheese with the eggs definitely puts me in that mood! Your eggs look great to me! I love the combination of flavors in this dish! I'm definitely craving some caramelized onions now. Wonderful breakfast. Fantastic. Beautiful colors. Wonderful presentation. Wow, this looks so yummy!! Thumbs up!!! !